At this point, Russell Westbrook notching a triple-double is hardly newsworthy. The turbo charged OKC guard gets them almost every night, and he does so with a world-historic usage rate. The only intriguing triple-double-related milestone left in Westbrook’s season will be whether or not he can keep up his stats for another few weeks and end the season averaging a triple-double for the first time since Oscar Robertson did it in 1961-62. However, Westbrook’s ultra-efficient game against the Sixers tonight was special amongst his 34 others this season. Westbrook finished with only 18 points, 11 rebounds, and 14 assists, which, considering the scoring total and the opposition, ain’t much. The thing is, it only took him six shots to get there. Westbrook shot 6-for-6 from the field and 6-for-6 from the foul line. That makes him the first player in NBA history to notch a triple-double and not miss a shot. This is a sharp contrast to his stink bomb against the Warriors the other night, as well as the reputation he’s somewhat unfairly earned as a reckless gunner. Yes, Westbrook does tend to take a tremendous number of shots and occasionally he can shoot his team out of a game. 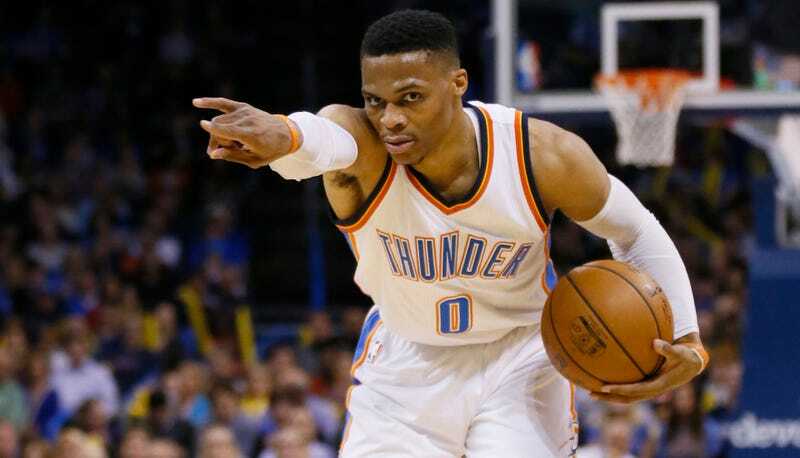 The triple-double is an arbitrarily defined plateau that encourages a bit of stat chasing, but Westbrook is still assisting on the highest percentage of his teammate’s made baskets in the NBA and shooting at a career-best clip from three. The man is not all-volume; hell, look what he does in the clutch when every opponent knows what he’s going to do! Even when he’s not scoring, Westbrook is still a highlight machine. He’s as aggressive looking for home runs on the outlet as he is going into the lane. Like I said, it’s fun when he gets on the break. With 12 games left in the regular season, Westbrook is sitting pretty with per-game averages of 31.4 points, 10.5 rebounds, and 10.3 assists. He’s going to finish with a triple-double. Russell Westbrook is the MVP. Russell Westbrook Is The Goddamn MVP, Clowns!